Myth: Health and safety has gone mad! There are few greater myths than that health and safety has gone mad. During the last four years we've debunked some truly ridiculous misrepresentations of health and safety, including the banning of conkers, firemen's poles and park benches. We've scotched scare stories about excessive safety signs, rebutted rumours about onerous risk assessments and kicked back at claims that kids need to be wrapped in cotton wool. This trivialisation concerns us. It confuses businesses about their responsibilities and workers about their rights. HSE publishes advice setting out the sensible and proportionate steps we can all take to deal with workplace risks properly. 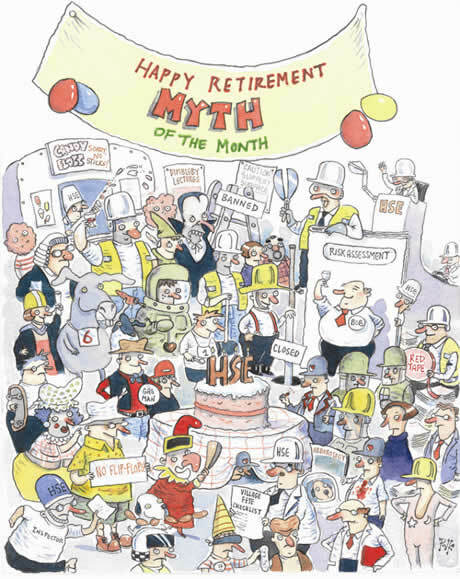 As we retire the myth of the month series, let us leave you with one thought - health and safety is about saving lives, not stopping them.